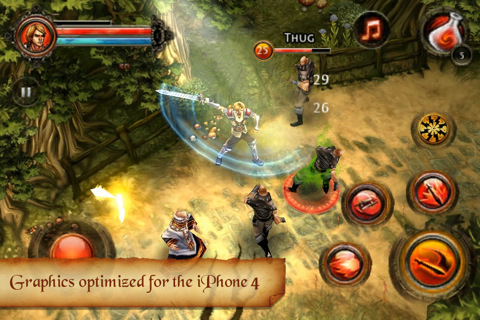 Gameloft has released Dungeon Hunter 2 for the iPhone and iPod touch. The game sells for $6.99 and is available now in the App Store. Dungeon Hunter 2 is above and beyond the level of what any RPG game has done before on the mobile iPhone platform. Gothicus is cursed with 2 sons this time around. In Dungeon Hunter 2, you have a brother, the King’s other child who is also your opponent, causing chaos in your world. You can go through the game in 3 difficulty levels that allow you to have higher caps and new items. Dungeon Hunter 2 is significantly improved and has integrated tighter multiplayer features, darker environments that are dynamically generated so you get a different experience each time you play the game. Moving around the map is also fluid, allowing you to move from one place to another freely. Destroy new 55 enemies and 11 bosses in 33 different areas. Playable classes in Dugenon Hunter 2 have been significantly improved as well. You now have the ability to play the game in not only Warrior, Rogue, and Mage, but starting with level 12 you can choose to specialize in skills by choosing to become a Shadowmancer or Illusionist. Now you can cultivate over 72 different skills such as Archer, Crusader, and Berserker as you move through the 100 levels in the game. Refine your character’s attributes using points including strength, dexterity, endurance, energy, defense, offense, recovery and magic. Hack and slash using 400 different dual, single-handed, and double-handed items you’ll pick up along the way stashed in various breakable bins and rewarded for killing enemies. What’s new is that that not only do new items give your character increased destruction power, they now also change your appearance in the game. Multiplayer improvements – While you can still role solo, Dungeon Hunter 2 gives you 3 ways to play with your friends in multiplayer mode: Local, Online, or Bluetooth. DH2 can be played over local or online WiFi, via Gameloft’s own Live Network or Apple’s Game Center with 2-4 players. You can host your own games and invite your friends. You can also use Bluetooth. Gameloft hosts leaderboards on the official website. Keep in mind that the game’s difficulty is automatically increased as more players are added to a game. MP works only with iOS 3.1.2 or higher on iPhone 3GS, iPhone 4, iPod Touch 3G or iPod Touch 4G. 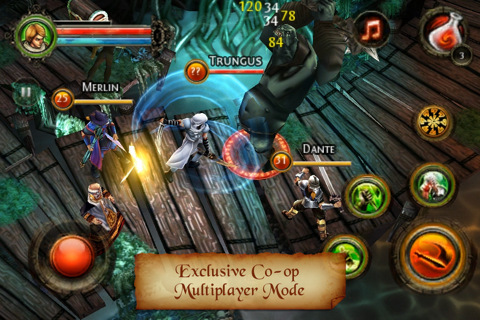 The soundtrack in Dungeon Hunter 2 is interactive, meaning it responds to the gameplay to create a natural environment that dramatically grows with the game’s intensity and difficulty, and is then gradually softened after a battle. There is also an easy to use iPod control built right into the gamely screen that you can use to play your own music playlists while you play. Movement can be set to either a virtual stick or use the touch move setting that lets you tap anywhere to move to it. AppSafari review of Dungeon Hunter 2 was written by Joe Seifi on December 9th, 2010 and categorized under Action, App Store, Featured, Fun, Games, RPG. Page viewed 5285 times, 3 so far today. Need help on using these apps? Please read the Help Page.